Hello, and welcome to my stop on the Simon Says Stamp Create Joy blog hop. Today I am honoured to be part of a group of bloggers celebrating Simon Says Stamp's latest release - a fabulous Christmas and holiday collection packed full of gorgeousness. You should have arrived from Nichol's amazing blog - oh how I love everything she makes… if not, head to the Simon Says Stamp blog to start from the beginning. 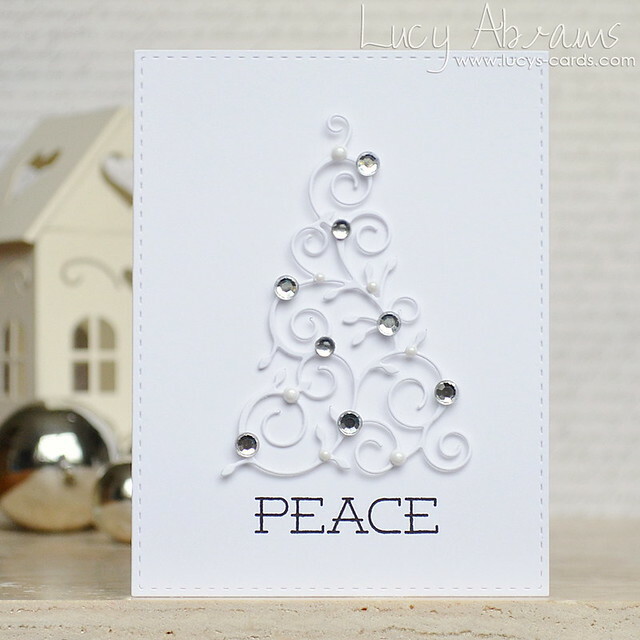 I created a clean and simple white on white card for you today featuring the beautiful Christmas Tree die. I cut it from white card, then adhered to a white Stitched Rectangle panel with tiny foam squares. I added various gemstones and pearls over the adhesive, and finished it off with a lovely sentiment from the Big Peace stamp set. I love the peaceful effect that white on white gives - and with a touch of silver sparkle it is a perfect colour combination for Christmas don't you think? As always, the lovely Heidi at Simon Says Stamp is being extremely generous, and offering a prize pack on every stop of the hop. Sop please leave a comment here to be in with a chance of winning a mystery package! The winners will be drawn on Monday, so be sure to leave your comment by Sunday night! Enjoy the hop, and thanks so much for visiting today. Simply stunning and so elegant!! Cette carte est sublime ! je viens de faire les découpes du sapin hier pour faire mes premières cartes. Wow, what a stunning and wonderfully simple card, Lucy! I think I might need that tree die! Clean and simple makes a statement here...beautiful! The simple elegance of this card makes it a stand-out in my book...so pretty! I do a lot of peace cards so I am in LOVE with yours!! Simple and elegant! Very pretty. I think I have this die or one very similar. Will have to try this. I agree with other comments, elegant , simple, clean ... just lovely. Quite stunning and simple all at the same time. Just lovely. Thank you so much for creating a gorgeous card that can be done rather quickly. With lots of cards to send out, I can't spend tons of time on each card and this is just wonderful! Love seeing the new October release. Beautiful card. Wow this CAS design is so elegant and gorgeous!! Monochromatic cards are so elegant! Very nice. I love these simple cards! Especially for Christmas. ..just beautiful! The white on white really exemplifies the sentiment. Gorgeous! This is So elegant. The white on white is something I would've never thought of doing. It works so well! How beautiful. I love it. Wow that die is so pretty and what a lovely elegant card Lucy. oh la la! lovely in white - sooo very perfect! Thank you for sharing! Perfect proof that sometimes simple is best, love the elegant look of your card! Wow! So simple but so pretty. Clean, chic and incredibly ELEGANT!!! I just LOVE it!!! So simple and elegant. Love that die - so delicate. Simple but so pretty and calm. Your card somehow makes me think about warm and white Holidays with family. Love it. I love the tree you made so Pretty! Very pretty, clean, and elegant looking card. White on white...so very beautiful and elegant. The intricate die is lovely....a must have. Very elegant and pretty. I love the little added sparkle of the gemstones. So beautiful and serene!! love it. So clean and sparkling, love that die! Love it! Simple but yet elegant. Love this tree die. The white on white is such an elegant look. Love the tree die! Such a elegant card!! Love it! Beautiful card! Simple, but absolutely gorgeous. Thanks your for sharing. Looks like a winter wonderland, to me. Lovely. Wow, what a pretty and elegant christmas card ! This die was my favorite from the release! Wow, it is so pretty with all the white and the sparkle of the rhinestones! Love the gems on the die cut piece. There's nothing else to say except - Absolutely Beautiful!!! This card is so stunning, love it!!! amazing so simple and elegant. Omg. That Just may be my Christmas card inspiration. Just Beautiful!! Plain and simple but so elegant. I love the white on white of your card with a touch of bling!! 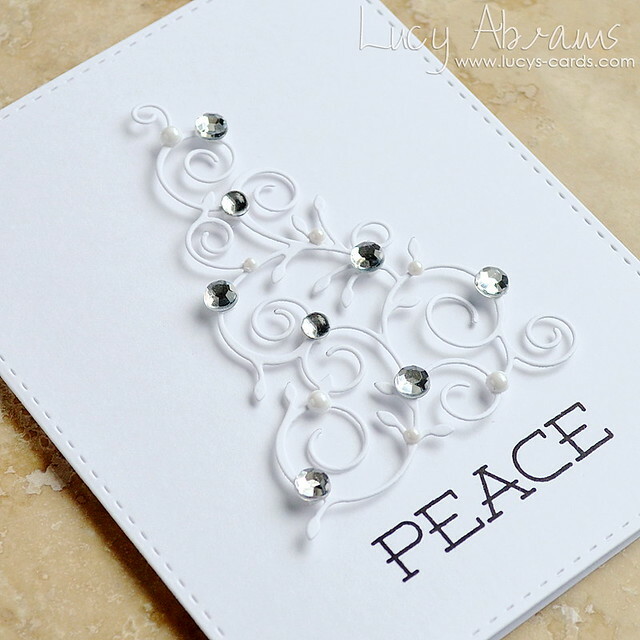 Luci--I love the beautiful simplicity of this card! In fact I love this whole product release! Elegant and simple...just like the season is meant to be...thank you! This is such a beautiful card! There's so much tto love in this SSS release! Stunning! The simplicity of white on white creates magic. Great card! Simple and elegant! What a beautiful, elegant card! Simply stunning card, Lucy! White on white is so striking! So elegant. Now I need that die too. What a beautiful sophisticated card. Love white on white. gorgeous. simply gorgeous. thank you for sharing your creative gifts with us! Absolutely stunning card. Thanks for the giveaway! So delicate! I am in awe that you popped it up. What a classy card, love the simplicity of it! with a little bling! Simply stunning. White on white perfection. comme quoi, comme on dit en français : qui peut le moins, peu le plus! So gorgeous and elegant! Love!!! I am discovering new and very talented young women on this blog hop. Your cards are unique and I like unique! Thank you for sharing! So beautiful and elegant. There is nothing quite like white on white for a very special effect. Thanks so much for sharing. How did you make it dimensional? Lovely! Wow what a gorgeous but elegant card. I love it! This card is so elegant, I love it!! Stunning! I was debating about this tree die but now I'm sold! What a simple, but elegant card! Love it! You people are killing me...each post makes me want more and more from this release. Absolutely stunning. Love the white on white. Lovely!! One of my favorites! White on white for Christmas!! Thanks. Just love it!! Wow! Beautiful pace tree! The sequins are the perfect touch! Very classy and wonderful! Oh How beautiful and elegant!!! Soooo Beautiful!! I don't know how you popped this tree up, but it looks wonderful!! Your card is stunning! I have had my eye on this die cut, I think it is going into my cart! Thanks for sharing. Wow!! This card is delicate and beautiful!!! So beautiful, but easy enough that even I could make it! LOVE this card! It's so pretty! I had to really look to figure out how you popped it up. LOVE IT!! Lovely card. So elegant & classy. I just love this elegant and simple card! Stunning card Lucy - just my cup of tea!!! Love it! Thanks for the chance to win goodies! Such an elegant card, Lucy! Wow... great holiday card... the rhinestones really make the tree pop! What are uniquely delicate beautiful card! I never thought of that. Ur cards beautiful. Love this hopping. Are the pop dots underneath the rhinestones? They must be super small. What a beautiful elegant card! How did you pop up the tree? I love it! Your card is so delicate and exquisite! Love it! A very elegant and beautiful card! You just can't go wrong with a white on white card for Christmaa with a little silver sparkle! Such an elegant card. Very sophisticated! I love the elegant simplicity of this card! This is such a classy elegant card. I love white on white, so crisp & clean looking. Beautiful!!! Elegant simple card. It is amazing! So simple and elegant, I love it! I love the simplicity and elegance of this card! This is beautiful. I cannot tell that you used any adhesive and the floating look is amazing. What a great way to use the SSS stamp sets. Thank you! Wow! This is, as many have said, very elegant and beautiful. What a classy look for the tree. So elegant! I wondered what that die-cut would look like, and now I am blown away and making choices is so much harder. It doesn't have to be difficult to be beautiful, does it? Thanks so much! Gorgeous card! Love this tree die! Simple elegance cards are my favorite types...lovely! Such an elegant, beautiful card. This die cut is so worth getting! Classy, elegant, sophisticated...and so incredibly gorgeous! I do think white and silver are a perfect combination for Christmas and your card is beautiful and so elegant! Such elegance I love the monotone look white on white. This is so classy and classically elegant and the twinkle of silver is gorgeous! What a classy, beautiful card! Such a delicate work you did, beutiful!!! Congratulations!! I am always a fan of a white on white card. Great job. So simply classic! Really beautifully done! Love the white on white, so elegant and beautiful! Love the simple and elegant look of this card. This is truly awesome. Very elegant and love how you made that tree float and hide those foam dots. God bless! I tend to overdo and keep adding, but this CAS card is just perfect. I love the font of the word peace. I love that it is so easy to achieve such an elegant looking card! Beautiful! So simple but so elegant. I love it. What a beautiful delicate card - this would be a present in itself! So elegant!! Love this die. Such an elegant card. Thank you for sharing. Beautiful card. Clean and simple, tfs! A truly stunning card. I didn't know they made foam square small enough to lift the design! Very cool effect indeed. Thank you for sharing! So simple and elegant! I also love to see a card where you don't need read and green for it to be Christmassy! I'm not sure what to say. Your card is elegant, beautiful, and delicate. Amazing work!!! So beautiful and classic in design! Oh my....I THOUGHT I was going to live that die.....but seeing it in action....LOVE LOVE LOVE! A really classy card. Simple an elegant. How elegant is this. What a beautiful, simple, clean beautiful card. I just LOVE it. Beautiful new release. I have so many on my wish list. Gorgeous card. Love the white-on-white. GORGEOUS!! So simple, yet so elegant! I love this- so simple and elegant and peaceful and sweet. Thank you. Love your elegant yet simple use of the tree. This card has the WOW factor for sure! I love the simplicity and elegance of it! I had to stop and stare at this for a while. Elegant eye candy. I agree with the others . What an elegant card. Simply outstanding. Just the right touch of bling. Stunningly elegant sums up this beautiful card! Stunningly beautiful and elegant card! This card is just beautiful. Thanks for sharing. Such a stunning card! Love the simplicity! Oh Lucy, this card is simply E-L-E-G-A-N-T ! There is nothing else I can say about this card except, "WINNER"!! !